I like casseroles that have all the benefits of casseroles, without ending up in the “midwest slop,” as I like to call it, category. I’m from the midwest! I will defend our name! The concept for this baked casserole is kind of like a cousin of mac and cheese. Except you substitute the mac for rice. The milk for vegetable broth. Add some vegetables and keep all the cheese. It’s a really good and feels like comfort food, but a bit healthier. No mayo, no cream soup. I’ve heard people say it’s the best thing they’ve made from pinterest. The husband got thirds. Prepare rice according to package instructions. I used to use a rice cooker, but lately I’ve been using my instant pot. And there’s always the classic stovetop method. Preheat oven to 450 degrees. Arrange chicken in a 9×13, foil-lined baking dish. Drizzle chicken with 2 tablespoons olive oil and season with 1/4 teaspoon salt and 1/4 teaspoon pepper. Roast for 45 minutes. Shred or slice chicken. Lower oven temperature to 350 degrees. Saute onion, celery, carrots, and garlic in a skillet with 2 tablespoons olive oil over medium heat for 7-8 minutes, until tender. Set vegetables aside. 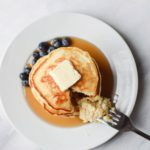 Melt butter in skillet over medium heat, stirring in wheat flour. Add 2 cups of shredded cheddar, vegetable broth, garlic powder, 1/4 teaspoon salt, and 1/2 teaspoon pepper. Stir sauce until cheese is melted, about 2-3 minutes. 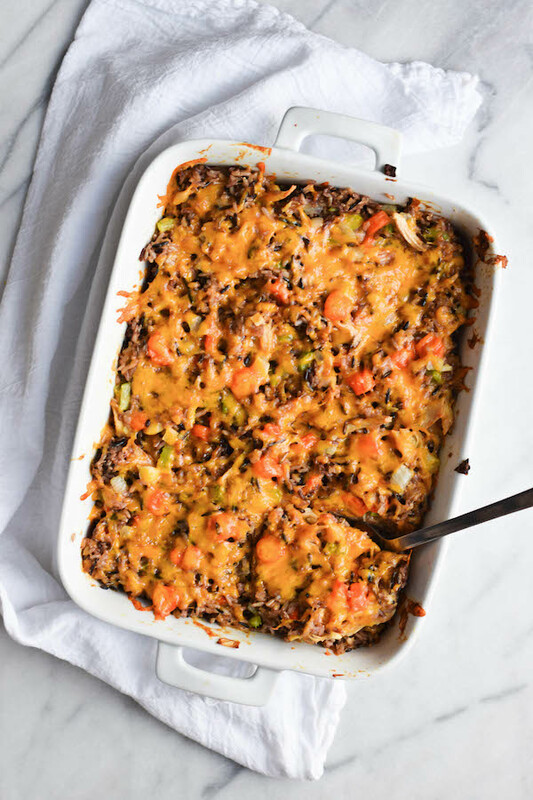 In a 9×13 baking dish, mix together rice, shredded chicken, vegetables, and cheese sauce. Top with 1/2 cup cheddar cheese. Bake for 25 minutes. Prepare rice according to package instructions. I used to use a rice cooker, but lately I've been using my instant pot. And there's always the classic stovetop method. Preheat oven to 450 degrees. Arrange chicken in a 9×13, foil-lined baking dish. Drizzle chicken with 2 tablespoons olive oil and season with ¼ teaspoon salt and ¼ teaspoon pepper. Roast for 45 minutes. Shred or slice chicken. Lower oven temperature to 350 degrees. Melt butter in skillet over medium heat, stirring in wheat flour. Add 2 cups of shredded cheddar, vegetable broth, garlic powder, ¼ teaspoon salt, and ½ teaspoon pepper. Stir sauce until cheese is melted, about 2-3 minutes. 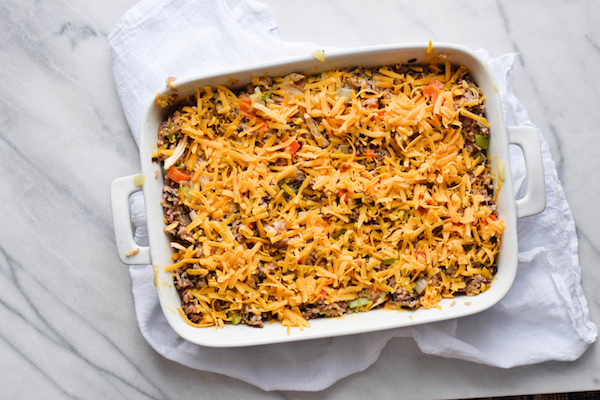 In a 9x13 baking dish, mix together rice, shredded chicken, vegetables, and cheese sauce. Top with ½ cup cheddar cheese. Bake for 25 minutes. Are you sure about a pound of wild rice? Cooked or uncooked it seems a bit much. Wow! This is yummy. I doubled the recipe because my family loves leftovers. It still fit into my lasagna pan. For a bit extra flavor, I added some Famous Daves chicken seasoning to the sauce while I was cooking it. I will definitely make this many more times. This looks like a recipe that can be changed easily – peas, sugar snap peas, broccoli, mushrooms, etc. However, it’s delish just like it is. Thanks for sharing. I made this today. I thought the amount of rice wa huge so I reduced the amount and used 8oz wild rice and 8 oz white rice. I also added mushrooms. I added the entire can of vegtable broth since the flour mixture was very thick. I also added 4 cups of cubes turkey. I will not add extra grated cheese. I don’t think it really needs the extra cheese.It’s nice to make in advance but I do have a lot of pots and pans to wash now. Use a big pot to saute celery, carrots, and onions. I made this and put it into 4 8×8 containers. (It’s just my husband and I) that gives us 12 servings at 430 cals a piece. Not too bad with a side of veggies! I used brown rice instead of white. Just did my best with calculating calories on this as written and thought I would post since a couple others seem curious. Total calories (based on 8 servings, using myfitnesspal.com) 5,259. Per serving: calories-657, carbs-63, fat-31g, protein-32g, sodium 661mg. 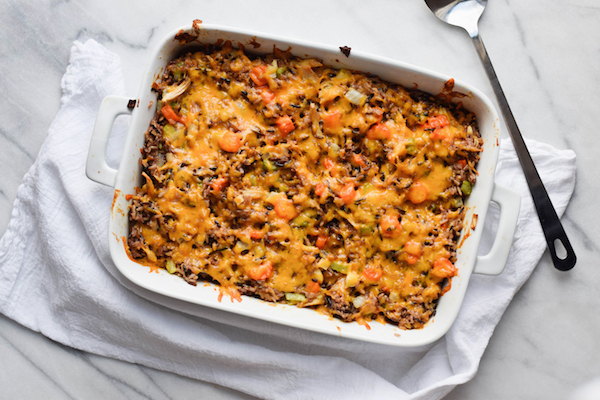 The cheddar cheese lends nearly 1800 calories, and the wild rice (calculated using Lundberg wild rice blend, one container approx 2 1/2c) lends about 1600 calories. I have never made this recipe, but it looks fabulous. I hope Rachel won’t mind me posting this. I plan to try to lighten it up a little so my family might enjoy it regularly. Thanks for what looks to be a scrumptious recipe! Thanks, Rachel for posting my calorie calculation above. I just made this dish and it was wonderful! I saved 1272 calories off the total recipe by decreasing the EVOO to 1 TBSP, butter in the roux decreased to 1 1/2 TBSP, cheese decreased to 2 cups. I had some leftover quinoa, so I added it to the wild rice mixture rather than the extra cup of rice and it was very good. It was not as cheesy or as heavy as I thought it might be. We also got closer to 10 servings out of it, so it really can go in our regular recipe rotation. Also, I served broccoli as a side, but it could easily have been incorporated into the casserole. Also to the comment below about the amount of garlic, yes, 2 TBSP is what I used and it seemed well seasoned and not overly garlicky at all! Two TABLEspoons of garlic seems like a lot. Is this correct? How many cloves would you recommend? I made this and sub’d chicken broth and added a little curry powder. It was amaze-balls! I just came across your site this morning looking for a recipe for chicken fried rice. Your food looks uumm uumm good. Going out right this second to get the ingredients for the fried rice. I want to make this casserole for dinner on Sunday but too afraid that my spouse will be looking at me sideways for making rice again within a short period but there is always Monday :-D. Thanks for sharing. Just one pack of like boneless chicken breast okay for this? I didn’t see where it said anything about the chicken? Thanks! Do you have the nutritional breakdown for this dish? My family loved this recipe. Thank you. I am making tonight, and last time we thought was a little bland. Would you recommend adding more spices to the mixing, or season the chicken before cooking? How do you cook your chicken prior to mixing? I dont have any veggie broth is chicken broth ok to use? I’m still confused about the rice. One person wrote that she used4 4.5oz. packages of Uncle Ben’s Long Grain and Wild rice, along with the seasonings but she did not mention if she also used the 2 cups of cooked white rice, or just the Uncle Ben’s mixture. It would be helpful to know the volume of the Trader Joe’s prepared wild rice. Like others, I at first was confused about the “Wild Rice”. Wild rice alone is just the black rice. With the amounts listed here, it would not look like the picture. I believe it it supposed to be the “Long Grain & Wild Rice”, which is a blend of white and wild rices. Wild rice alone was very expensive, as I imagine it’s meant to be blended. I myself, used 4 (4.5oz) pks of “Carolina Long Grain & Wild Rice” with seasonings. It was perfect! Very delicious! This was AWESOME. I wasn’t sure about the rice situation, so just used 2oz of non cooked wild rice and substituted brown rice for white. I also added a bit more chicken, just because I had it, and it made two casseroles. One for my fam, one for a neighbor. DELICIOUSNESS INCARNATE! Definitely going in the rotation. Thanks so much!!! Try using one of RiceSelect’s all-natural Royal Blend products. Alreaddy had different rice blended together; don’t have to cook two different kinds seperately and its delish. Such a great dish! So much healthier! The rice was a lot but I just worked with it. Definitely a recipe keeper. I used half the amount of cheese and that was PLENTY. Was tasty. You could use all kinds of veggies in this to mix it up. This looks super yummy. 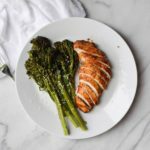 Has anyone tried prepping this meal the day before, putting it in the casserole diesh then pulling it out of the fridge and baking it the next day? This would be great for Mondays when I work late. Yes- it works great. This recipe is twice as much as what my family will eat so I often split it in half and freeze the leftovers. They reheat beautifully in the oven! This is my second time making this its that great. I usually buy the grill chicken from my grocery store and add it. I throw in lots of garlic and pepper. I made this tonight and it was quite yummy. I used carrots and zucchini from our garden. I know there have been some questions about the wild rice so I thought I would share my experience. I went ahead and prepared a 16oz package of lundberg wild blend rice (purchased at walmart) and for me it did make a ton! About 7 cups. I went ahead and used it all and it was a lot. It filled my extra big casserole dish to the brim. Next time I will either make less wild rice or double the cheese sauce. 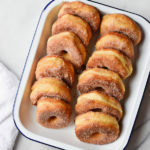 I noticed on another site that makes this recipe, they use 16 oz. of prepared wild rice purchased at Trader Joes. I’ve never tried that. But regardless I will make this again. I had enough to freeze some for another meal sometime this month. Awesome! Thanks! Thanks Lesley! Glad to hear it. I did not, but it would work fine. For the wild rice, would this be something like Uncle Bens wild rice mix? Or should I look for a box of just wild rice? I guess I’ve never noticed this before. Yep, I’ve used Uncle Ben’s before. ***** I just made this dish and it is so so so good! I went with 2 cups of cooked white rice to 1 cup cup of Trader Joe’s rice medley (which also has barley) It is so good I’m having to stop myself from eating it for breakfast! This will definitely be a meal that I make to give to others who are sick, sad, new baby etc. 5 stars! Thanks! I use it for that too. I read all of the comments and I’m really sorry but I still find this wild rice part confusing. I couldn’t find any package that said 16 ounces I saw 6 ounces (box) and big bags of 36 ounces which would make way too much rice. Your pictures seems to show more white rice and wild rice by a lot because wild rice that I’m finding is all very dark. What am I missing? So sorry! The exact amount of rice does not have to be to specific, just to fill up a 9×13. Two six ounces packages would be great. Hope this helps. This looks amazing! Can I substitute the celery for another vegetable? I was thinking zucchini? Thanks again! Can I use brown rice? Or will it cook differently? Brown rice works great! I’ve been using it lately trying to be more healthy. And it does freeze well, freeze in whatever serving size you want, grab it out of the freezer and there’s your lunch… just saved time and money! That’s great to know, Donna. Thank you. Oh, just wonderful to have a casserole withoud pasta or potatoes but with rice. This looks really yummy! That’s great! Yes, I like the healthy-factor. Soo….2 cups each white and wild rice before cooking? This has been brought up several times so I guess I’m not the only one thats confused. The recipe calls for 16 oz. wild rice, prepared. To me that means 2 cups of prepared rice, but your answer says no, 16 oz. dry rice then prepare that. Do we want 8 cups of the prepared wild rice? I’ve edited the instructions, so I hope this is clearer! Made this a few weeks ago and it turned out great! Do you think it would freeze well, if you did everything up until baking? Yes, I think freezing is a great idea. This was delicious! Even our picky 9 yr old liked it. That’s great. I’m a picky eater too. 16oz wild rice, prepared? That is about 8 cups… should this say 6oz? My experience was that it turned out to about 2-3 cups. I always use 16 ounces. This looks great – just one question. Did you use wild rice or a rice medley? I am preparing this for dinner tomorrow and my wild rice to other ingredient ratio seems off compared to your picture – there is a TON of wild rice and your pictures look less brown … am I missing something? I used wild rice. I don’t think so… Let me know how it works out for you! Yes, Dave and I are the same way! We eat so much of it. Glad it was a hit! 16 ounces dry. I can relate – rice measurements can be confusing! Your instructions mention garlic salt but you haven’t indicated an amount. Please add to ingredient list. Thank you. This looks so yummy I want to make sure I have everything I need tonight. Just a dash with the salt and pepper. I just made my grocery list for this recipe’s ingredients. I plan to make this for dinner tomorrow night. I’m sure my husband will love it! Thanks for sharing. I’m checking back in, one day later. I made this for supper tonight and my husband did love it after all. It was so easy, too. 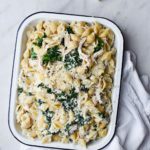 Finally a casserole without sour cream, mayo, and cream of anything soup. It tasted good. Thanks for sharing. I’ll be making this again. Yes! That’s what I’ve been looking for too. Glad you liked it. Yum! Made this tonight. Prep took me forever, but I’m extremely new to this whole cooking thing. Your recipes are helping me learn though! Thanks for another awesome night! so glad to hear it. all the best!